There are many benefits that come along with owning a hot tub. Aside from being the ideal spot to relax, hot tubs can provide several health benefits, add more value to your home, and offer the entire family a fun place to unwind. There are few things that can enhance your home design more than a luxurious hot tub. Adding a hot tub, swim spa or swimming pool combo to your outdoor living space will help you to create your own personal oasis where you can relax and enjoy the view. By owning a hot tub, you no longer need to drive to a spa or visit a faraway location to enjoy a relaxing and therapeutic soak in a spa-like environment. Plus, hot tubs and similar products can help add more value to your home which can be extremely beneficial if you ever decide to sell. Soaking in a warm, massaging hot tub for just a few minutes each day can help you to relieve tired and sore muscles, reduce stress, relax and meditate. A massaging tub can offer a variety of benefits to different types of people. Some may use the spa simply for its health benefits after a long day at the gym or a run around the neighborhood. Others may choose to use their hot tub to reconnect with friends or to spend quality time with their family, which can also help you to de-stress. Regardless of what your reason may be, your body will thank you for investing in this worthwhile product. Hydrotherapy has been studied over the years and has shown to eliminate various types of physical and mental health conditions. This type of water therapy can help individual overcome their aches and pains, and it has also been shown to assist with common illnesses and other ailments. A hot tub can provide you with a form hydrotherapy that you can take part in at any time you choose. The healing qualities of warm, flowing water has been evident in healing processes for centuries when natural hot springs provided our ancestors with the natural healing benefits of hydrotherapy. Now you can experience similar benefits by soaking in your very own hot tub. One of the most exciting benefits that comes along with owning a hot tub is the fun you will have hosting your very own hot tub party. Now you will never run out of things to do with friends when you have a get-together. 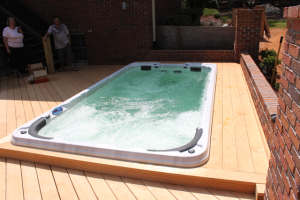 Hot tubs easily become the main attraction at backyard barbecues and other outdoor parties. Plus, you can enjoy relaxing in a hot tub any time of year so your parties do not have to be limited to the warm summer months. 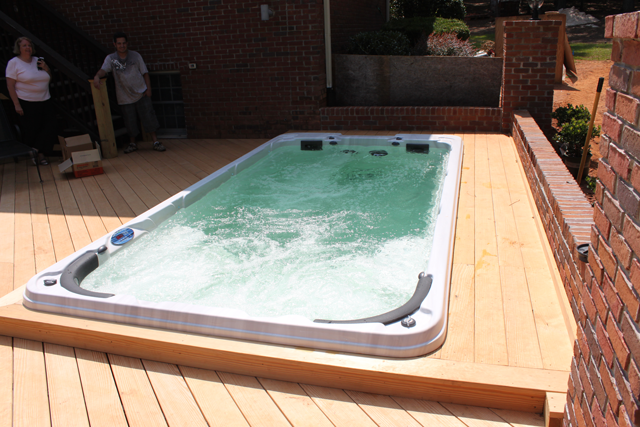 Owning a hot tub is a great way to guarantee that your backyard parties will never be the same again. There are various types of hot tub styles and designs available to match your own personal taste. Swim spas and swimming pool combos make the experience even more enjoyable for everyone involved. This entry was posted in Uncategorized by James Bender. Bookmark the permalink.